A Mongoose AFP machine at Ingersoll’s Rockford, Illinois, facility just prior to shipment to Goodrich. The equipment will be installed in Goodrich's Riverside, California, USA, facility and used for the production of nacelle components for the Boeing 787 Dreamliner and the Airbus A350 XWB aircraft programmes. Goodrich holds contracts to provide the nacelle systems for both aircraft. The addition of the Ingersoll Mongoose AFP machine will enable Goodrich to meet current and ramp-up production rates for these two new composites-intensive aircraft. 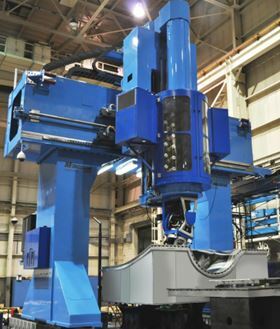 Like the prior two machines purchased by Goodrich, the new Mongoose is a gantry vertical machine that is capable of lay-up on stationary female moulds. Ingersoll Machine Tools is a leading supplier of vertical gantry fibre placement machines, with eight machines already installed and producing structural aircraft components. All Ingersoll vertical AFP machines lay-up on stationary concave and convex tooling for a variety of applications, ranging from fuselage sections to nacelle components, wing skins and vertical and horizontal stabilisers. Machining supplier Mikrosam has developed a machine that can integrate an AFP head for thermoset and an ATL head. Composite manufacturer Mikrosam, based in Macedonia, plans to exhibit its range of ro-botic solutions for composites at JEC.